Categories: Boat maintenance, Cruising, Living aboard, Sailboat | Permalink. What’s the first, absolutely most important item of safety equipment on a boat? The one thing that will save your bacon and turn potentially dangerous conditions into “Well, that was kinda rough – what’s for dinner?” moments? You won’t find it in the West Marine catalog, nor anywhere online, and it is clearly lacking far more often than it should be in all kinds of vessels, both pleasure and professional. It’s a well-trained, conservative crew. And the second most vital thing? A solid, well-found boat. No one can be absolutely prepared for everything 100% of the time, and nobody, I suspect, can afford to purchase and maintain every single “You’ve gotta have this piece of gear or you are gonna die!” item on the market. In fact, purchasing technology to handle a specific potential emergency is, I believe, setting yourself up for a fall. Vessels that we think of as relatively primitive were successfully rounding Cape Horn long before the EPIRB, emergency raft and satellite communications were around, and while there were definitely losses of life and shipping, there were also many, many successful voyages through the most violent, unforgiving waters in the world. Ask the oldtimers how it was that most ships made it, but only a few didn’t, and you quickly discover a pattern. First, the vessels were well found (ie: They were sound and well fitted out with strong, reliable gear) and second; they had well-trained, experienced crews and commanders who knew how to get the most out of their vessel, and how to manage her to avoid damage. So how does the crew of Sionna stack up against those Cape Horners of old? Well… ah… see… We’ve got some catching up to do, actually. 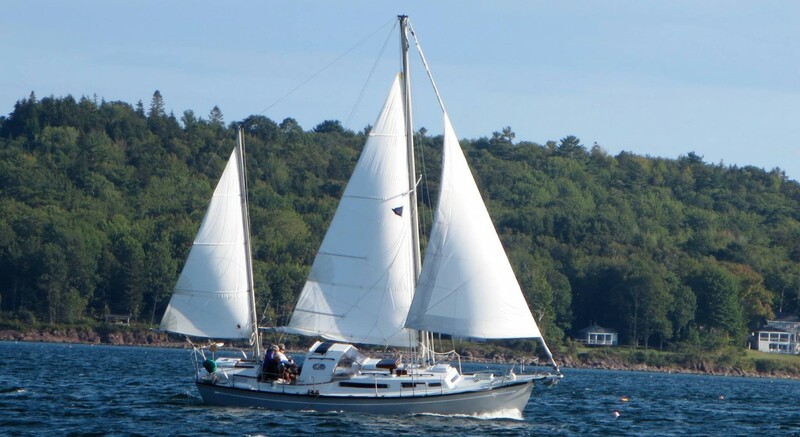 Keith (your author) has been sailing along the coast of Maine for seven years now. (That is, if you don’t count prior lives – I have a feeling I may have been one of those Cape Horn guys in a prior incarnation, but I can’t prove it.) I’ve sailed whenever I could on my own or other’s boats, done some racing (on other people’s boats – a great way to learn sail trim, by the way!) and have read every single piece of boat and nautical literature – both fiction and non- that I could lay my hands on. I also have many years of command training and experience, risk assessment and management skills, and mechanical troubleshooting and repair, all due to my prior careers as a professional pilot and aircraft mechanic. Does that make me an “experienced sailor”? Nope – but I think it does make me eminently trainable, particularly on the job. Nicki (second in command) has less sailing time than I, having come to it as a result of falling in love with a guy who owned a boat and loved to share his addiction. She’s a quick study, and has a better sense of the vessel and its needs than she sometimes realizes. As is often the case in cruising couples, Nicki is often the crewmember who’s less comfortable pushing the comfort zone and stretching into an experience we’ve not had before – and this raises a really, really important point. If you’re sailing as a crew, you have to agree to ACT like a crew, and that means that the most conservative voice has veto power. I’m not talking about arbitrary, heels dug in, angry-tantrum-just-because-I-can-power, but reasoned, “here’s what I’m concerned about” power. If I think the weather is going to clear in an hour, and she thinks it might not, we’re going to wait that extra hour and see, unless there’s a damn good reason that we MUST push forward now. And when Nicki says we should reef the sails, we reef. Period. But then, I also live by the maxim “Reef Early and Often”. We take a pretty conservative approach to life aboard Sionna, hoping to keep our learning curve ahead of our experience curve, so you’ll note that our ambitious plans for the next year or two involve the ICW, Florida Keys and Bahamas, and not an ocean passage to the Azores and Europe. Would I like to do those trips someday? Yes – if we reach the point where that seems like a reasonable challenge. But we’re not there yet – we may never get there. That’s ok – there’s a whole lot of sailing between here and the Bahamas! Categories: Cruising, Cruising risk-management, Living aboard, Sailboat, Uncategorized | Permalink. So how does one prepare a boat for cruising? Not to mention preparing the crew, and arranging one’s affairs… The mind fairly boggles! Those last two will likely be the seed for later posts, but the first – preparing a boat – is today’s topic. This gets a bit long, so if you’re the sort that has no interest in DIY and saving a few dollars by investing your time, you might want to skim. Anyway, for me (Keith) it always begins with a list. But then reality steps in. Ok, which boat? What type, what size, how much can we afford, what condition is it in…? We have a prior blog – A Yacht’s New Chapter – that details our first approach to finding our perfect cruising boat, and for anyone considering buying a neglected or abandoned boat as a DIY project, it’s highly recommended reading. I’m not trying to discourage anyone from that approach, or even from building your own boat. But I also know that the percentage of potential cruisers who actually end up going cruising drops dramatically when restoration or construction is included in the plan. Only you know if your primary goal is actually cruising, or if you’d actually rather be working on the boat instead. In our case, I realized that I simply wasn’t going to live long enough to both restore our Alberg 35, Renaissance, AND take her cruising, and since cruising was very much the goal, we made a major shift in our approach, and after considerable soul-searching and study, bought a boat that was “ready to go”. Note the quotes around “ready-to-go”. Trust me, there is no such thing, at least not within the income range of 90% of us. Following the advice of the pre-purchase survey and the desires of the insurance company, I spent about 200 hours of labor and an additional $2000 in parts to address a list of concerns numbering perhaps 15 items. Note that this was on a boat which really was in very good condition, and had been lovingly maintained by her talented and devoted owner of 23 years. Sionna was in sail-away condition the day we first saw her (photos above), yet we still put the equivalent (had we hired the work done at local going rates) of $14,000 into her, on top of her purchase price. And we’d never even seen her in the water yet. What sort of work? Remove, clean and re-attach all grounding straps throughout. Replace many pieces of running rigging line due to age or improper materials. …all this and more before we launched the boat for the first time. Let this be a lesson to you if you’re thinking of buying a boat and taking off – you will either spend a lot more up-front than you hope so that someone else has already done all this work, or you will spend it after the purchase to assure that your new floating home will stay floating. All boats – even very good boats – need continuing maintenance work to stay that way. We launched Sionna for the first time in May of 2015 – a very happy day for both us and her former owners – and spent the season getting to know her. She sailed better than my unspoken fears suggested (her sail area to displacement ratio is pretty low), and her comfort level is much better than our prior experience in other boats. She just feels “right”. We spent almost half the summer living aboard, including our first two overnight passages, our first fog encounters, our first whale sightings… And lots of gorgeous sunsets. But just as important as those delightful and critical first experiences, all that time living aboard also gave us a chance to form our impressions of her as a floating, long-term cruising home. What did we love? What did we miss? What could we just not live without? What could we let go? Those questions became the basis for – yes – another list! Once we’d hauled the boat for the season in October ’15, we began making a list of equipment and refit projects that we felt would make living aboard something we would truly enjoy, rather than just tolerate. Camping is fun, for a few days. Camping for 8 months might loose a little of its luster! So below is that winter work list, containing 45 separate “projects”. It’s interesting to note that a given project frequently has a number of component steps to completion, each of which is almost a project in itself. For example, there’s a line item for “Install manual anchor windlass” But in order to install the windlass, I had to fabricate & install an oak doubler plate under the foredeck to carry the loads imposed by the windlass, and then remove, modify and replace the hawse pipe so that the anchor rode from the windlass would feed smoothly into the anchor locker below. To install the stove I had to disassemble the stove area of the galley and re-build it to allow the stove to swing on its gimbals. I’ve got about 25 hours in each of those projects alone. I note also that this list is roughly twice as long now as it was when I started last fall. That’s because each project makes me more intimately familiar with the boat and her systems, leading to more “good ideas” to add to the upgrade list! This is what you call the rachet effect of boat work – one project leads naturally to another, and if you don’t draw a firm line, YOU WILL NEVER LEAVE THE DOCK! It happens all the time. These aren’t all going to get done, and I’m comfortable with that. My list also includes marks to prioritize the items on it, and when it’s time to launch in the spring, I’m sure there will be items that aren’t done. I don’t care. In she goes, I’ll pack some tools, and if I feel motivated enough and need those few “comfort items” badly enough, I’ll do them. But come August 15th or thereabouts, this boat is heading south with us on it. That dream hasn’t really changed much since the days of Renaissance, the boat we intended to restore and take cruising, but it has certainly accelerated. In the last year, Nicki and I have sold all real estate, begun the agonizing task of sorting through and distributing or discarding anything we can’t fit on the boat and don’t want to pay to store, bought a 35′ RV as our summer home, closed our small home maintenance business, and just generally been really weird and antisocial. It’s kinda fun. And of course we bought Sionna, our 32′ floating cruising home, sailed her for a season (including our first overnight passages and fog-bound adventures), and are now hard at work upgrading, updating, polishing and priming for the adventures that await. Check out our pages here on the blog, on describes the boat, and the other the journey we have “planned” to begin in August of 2016. “Planned”, because the first rule of safe, enjoyable cruising is to be flexible. We’d like to make it to Sarasota Florida by Christmas next year, but you know, the weather and tides always trump plans, so if we’re late, or don’t make it until February, that’s ok. We intend to enjoy the journey. If that concept – enjoying the journey, whatever it is – appeals to you, I hope you’ll follow us and tag along. We won’t be posting every day – heck we may only manage a couple times a month, since sitting in front of the computer is a lousy way to enjoy the sunset. But we will, hopefully, be sharing some of the ups, downs, trials and elations of our trip to the sun. Oh, and the name of the blog? That’s not original, of course, and many folks have used the concept. Nicki and I joke aboard – and sometimes here in our winter-bound rental house – that “The butter’s not melting!”, meaning that the ambient temperature is too cool for comfortable human habitation. We keep the butter in the bilge aboard Sionna, which is below the waterline and therefor the same temperature as the water. When we head south this summer, we’re going to be watching the butter very carefully, because there’s a bottle of champagne waiting until it forms a yellow pool in the dish. When that happens, we’ll know we’ve gone South “’til the butter melts”. Categories: Boat maintenance, budget minded, Cruising, ICW, Sailboat | Permalink.